The hominid cranial base is the treasure trove of the skull and as such, it has been studied extensively over the past 150 years. While its complex topography is well noted, as well as the major differences between humans and apes, very few studies compare the morphology of early hominids to other recent species. Since these hominids hold data to the true nature of the basicranium morphocline, they must be included in any evolutionary studies aiming to decipher their taxonomic affinity. 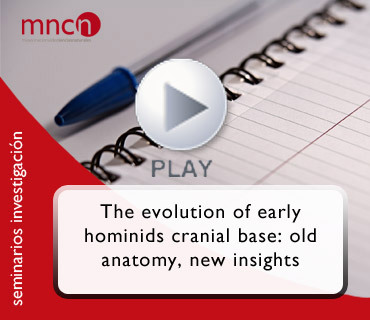 The aim of this research is to try to understand which of several possible processes shaped the human and hominid cranial base, and the evolutionary relationship between and within australopithecines clade. Ponente: Alon Barash, Galilee Bar Ilan University, Zefat, & Department of Anatomy and Anthropology, Sackler Faculty of Medicine, Tel Aviv, Israel. Seminario organizado por el Departamento de Paleobiología del Museo Nacional de Ciencias Naturales (MNCN), CSIC, y retransmitido a través de Cienciatk.